Removes nail polish without drying nails and skin. 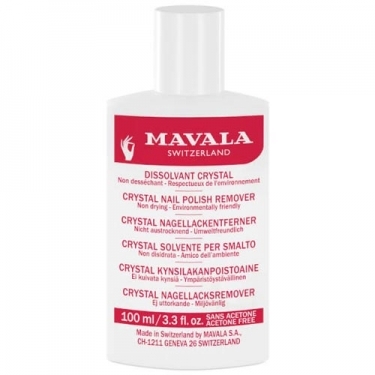 DESCRIPTION: Crystal Nail Polish Remover from Mavala is a non-acetone varnish remover for the nails. This product is very gentle as it removes the varnish without drying the nails and the skin and is suitable for all types of nails, even fragile, delicate or dry nails. It is also environmentally friendly, thanks to carefully selected ingredients that are easily biodegradable and help protect the environment. In addition, it is colorless, odorless and non-flammable. It takes a little longer than an acetone remover, but it is much nicer for nails and skin.